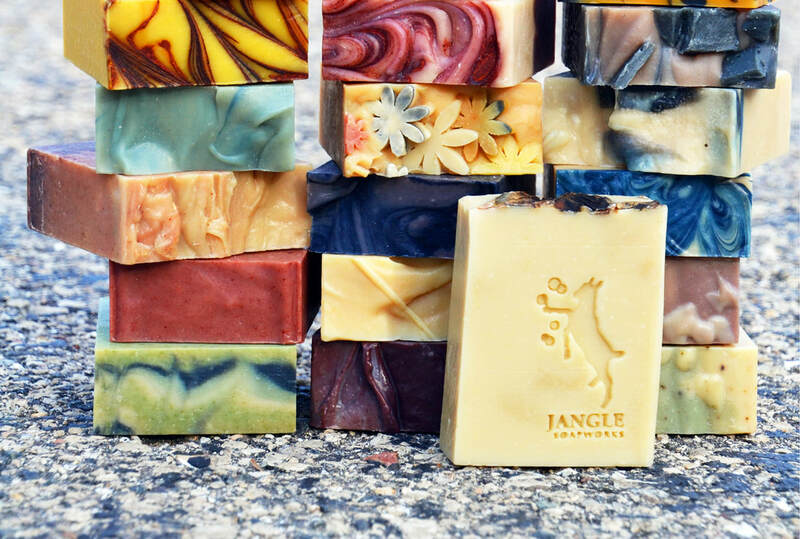 Go local with Jangle SOAPworks all natural goat milk soap. •All goat milk is from our own naturally raised hand-milked goats! Many people are still washing their skin with soap made with water. Switching to soap made with goat milk can truly benefit your skin’s health. It is wonderful for people with dry or sensitive skin, or conditions such as eczema and psoriasis. It is also perfect for healthy skin that wants to stay that way. Unprocessed goat milk fresh from the farm contains many benefits. We use only the fresh real deal. When I first started using goat milk soap, I quickly realized that I didn't need near the moisturizer that I previously had. We use a wood burning stove to heat our house in the winter. With our long Wisconsin winters, that dry heat can be tough on the skin. We used to go through bottles and bottles of moisturizing creams and lotions. Now, we hardly use any. That was quite a revelation to us. Then we heard of friends who were using our soaps to successfully treat their child's eczema. Goat milk soap quickly became our all-the-time daily soap! Here are just a few of the benefits of using soap made with goat milk. Alpha Hydroxy Acids. Goat milk contains alpha-hydroxy acids such as lactic acid which is an exfoliant that helps remove dead skin cells from your skin’s surface. This helps cleanse and soften the skin, while leaving new cells on the surface of your skin that are smoother and younger looking. The alpha-hydroxy acids are so effective because they break down the bonds that hold the dead skin cells together. Removing dead skin cells will help many skin conditions by removing irritation. Water-based soaps may use harsh chemical acids to accomplish this, frequently with skin-damaging results. Vitamins. Goat milk contains many vitamins, but is particularly high in Vitamin A and amino acids that nourish the skin, repair damaged skin tissue, and maintain healthy skin. There have been several medical studies showing that creams made with Vitamin A reduce lines and wrinkles, control acne, and provide some psoriasis relief. Goat milk is also rich in Vitamin D and choline, and contains vitamins C, E, K, niacin and folate. Cream. Fat molecules are an important part of making good soap. The cream that is present in goat milk helps boost the moisturizing quality of goat milk soaps. Since many people suffer from dry skin, particularly in the winter months, this is an important quality for soap. Goat milk soap will not dry your skin out like many other soaps. This is important because keeping skin naturally moisturized helps keep skin healthy. Minerals. Goat milk contains important minerals for the skin. It is an excellent source of calcium, magnesium, phosphorus, riboflavin (b12), potassium, selenium, zinc and iron.